Business leaders are increasingly relying on cloud technologies to enable their digital transformation strategies and provide competitive differentiation of their products or services in today’s global markets. In fact, 87% of enterprises are already running business critical applications in the cloud, while 93% consider it as key catalyst for digital transformation. While cloud adoption has hit the mainstream, CIOs and other IT leaders face significant challenges when performance assuring their applications in cloud. In this transformative landscape, there is a growing lack of predictability as apps, data, and users are spread across multiple locations and networks. Compounding this unpredictability is a lack of strategic IT architecture and legacy performance testing tools that are retrofitted for cloud that weren’t designed to deliver on the expected outcome. A CIO’s ability to navigate these architectural complexities, selection of right set of tools underpinning the delivery process are crucial to ensuring application performance and harnessing the powerful benefits that cloud can offer. Moving applications and data to the cloud imposes new demands on the corporate network and impacts two performance constraints: bandwidth and latency. Not understanding the true ramifications on these two constraints can easily offset the expected business value of moving to the cloud in the first place. During and after the migration, bandwidth utilization increases and traffic patterns begin to vary significantly. Quite often, network links become saturated, which can degrade the end-user experience of both existing applications and the newly deployed cloud application. Moreover, in traditional network architectures, cloud destined traffic is often backhauled to a central gateway located in the corporate data center for security reasons. As a result, cloud applications end up traveling a longer distance to reach users when compared to current on premises equivalents. Therefore, the time it takes to complete a business transaction may increase, sometimes dramatically, due to the added latency. 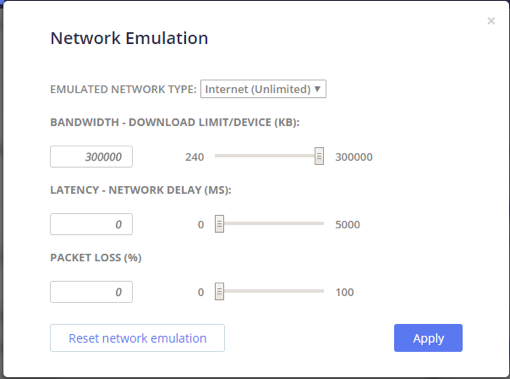 To Visualize and quantify these end-to-end network constraints on a pre-migration basis, CA BlazeMeter’s Network Emulation, can model load profiles to reflect real-world network connection types such as 3G, LTE, WiFi and more, as well as set custom bandwidth, network latency and packet loss properties. This enables organizations to simulate network loads during performance tests to provide more realistic test results. By running “what-if” scenarios, you can predict the impact of change on application response times before you migrate to the cloud, and then assess the effects of adjustments made to network and application parameters. Application migration is a journey, where performance problems do occur, but when they do, IT leaders need the ability to quickly pinpoint and resolve the issues. Having a proper application performance monitoring tools in place allows IT organizations to decrease mean time to resolution (MTTR), reducing support tickets and cutting technical costs related to migrating and supporting the cloud application. And when performance issues stem from the cloud provider’s services, it allows IT to quickly escalate and hold the providers accountable for agreed upon SLAs. CA BlazeMeter can correlate application load-test metrics with CA Application Performance Management (APM), Amazon CloudWatch, Dynatrace, NewRelic, AppDynamics to provide a 360-degree view of your application performance. Together with CA BlazeMeter, these solutions make it much easier to find the source of bottlenecks in the application stack, such as a slow method or a problematic database routine etc. Complexity and unpredictability can makes ensuring performance of applications moving to the cloud difficult for IT Teams. But, With CA BlazeMeter, organizations can run massively scalable, open-source-based performance tests against all apps, be it web, mobile, microservices or APIs from the cloud or behind the firewall to mitigate risk, ensuring superior performance, and deliver predictable business outcomes.